Car Wash Guys to Attack Corporate Office Washing in Gilbert, AZ . As we prepare for a frontal invasion on the would be enemy competitor in Gilbert AZ, one thing stands out as the common battle cry. That is "Customer Service." The Car Wash Guys are serious about winning market share and even more serious about keeping it. We must liberate these customers from inferior service which has been forced upon them against their will. We cannot accept a competitor who does this to his own folks, that is unacceptable. We have only one thing to say to this competitor, be exiled to a more degraded part of the city or face the consequences of Team Yellow. 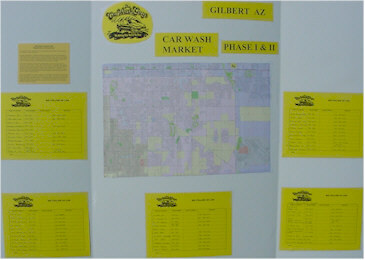 We are presently having our BMPs reviewed by the Storm Water Compliance Department and we have volunteered to do car wash fundraisers in the area, joined the chamber of commerce and agreed to sponsor Gilbert Beautification Days. We feel as we run off the older and less image conscious mobile car wash companies and take significant volumes from our fixed site carwash competitors, that it is our responsibility to give back to the communities we serve, after all once they vote for The Car Wash Guys with their dollar, why not show them a little bit of common courtesy and our way of thanks.